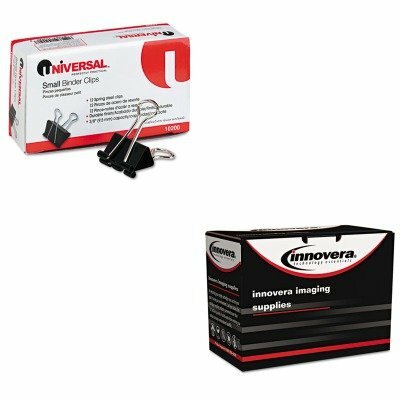 KITIVRE412AUNV10200 - Value Kit - Innovera E412A Compatible (IVRE412A) and Universal Small Binder Clips (UNV10200) by Innovera at Marco Marcucci. MPN: IVRE412AUNV10200. Hurry! Limited time offer. Offer valid only while supplies last. lt;stronggt;IVRE412Alt;/stronggt;lt;BR/gt;Innovera E412A Compatiblelt;BR/gt;High quality, meets or exceeds national brands. Consistent performance. lt;stronggt;IVRE412Alt;/stronggt;lt;BR/gt;Innovera E412A Compatiblelt;BR/gt;High quality, meets or exceeds national brands. Consistent performance. Significant savings. Device Types: Laser Printer Colors: Yellow Page-Yield: 2600.lt;BR/gt;lt;BR/gt;lt;stronggt;UNV10200lt;/stronggt;lt;BR/gt;Innovera E412A Compatiblelt;BR/gt;Ultra-efficient binder clips feature handles that can be hung, folded flat against clipped material or removed for permanent binding. Efficient triangular design provides optimum strength and compression. Clip/Clamp Type: Binder Clips Colors: BlackSilver Materials: Plastic ClipSteel Wire.